Chill Its Evaporating Cooling Vests Provide Cooling For Warm Weather Or Outdoor Workers. Evaporating Cooling Vests are made of activated, polymer-embedded fabric inside, water-repellent liner and black cotton-poly elastic trim for long lasting durability and performance. 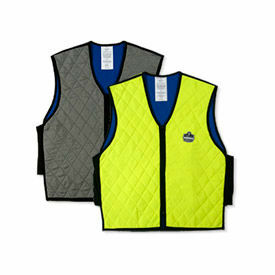 100% nylon materials and quilted nylon outer layer provides a lightweight, durable, and washable vest. V-neck with zipper closure. Soak in cold water for cooling relief. Available sizes are M, L, XL, 2XL, 3XL and 4XL.. Colors are Gray or Lime. Chill-Its® Phase Change Cooling Vests Provide Lasting Comfort While Working In Extreme Heat. Chill-Its® Phase Change Cooling Vests are made of flame-resistant Banox FR3 fabric for long lasting durability. Comfortable cotton with hook and loop closure for wearer ease and convenience. Cooling charge packs insert easily into interior mesh pockets for up to four hours of cooling. Vest sizes areS/M or L/XL. Available colors are Khaki or Orange. Vests available with or without packs. Additional charge packs sold separately. 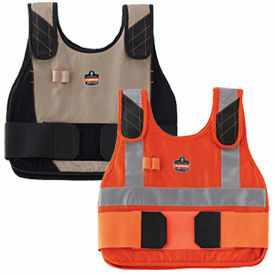 OccuNomix Cooling Vests Are Used For Providing Cool Body Relief In Extremely Hot Working Environments. Allegro Cooling Vests Are Used For Applications Including Construction, Industrial, Manufacturing, And More. 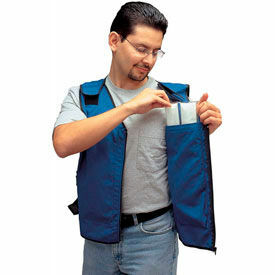 Allegro cooling vests are made of high quality materials for long lasting durability and dependability. Vests deliver constant and adjustable cooling for extreme temperature applications including foundries, steel mills, painting operations, and more. Units allow full range of motion and may be used under protective clothing. Cold water activated for hours of comfort. Hook and loop over shoulder and side straps allow optimal fit. Includes four pockets for inserts and zipper front. Type is Cooling Vest. Sizes are Standard, Large, X-Large, and 2X-Large. Package quantity is 1. Dimensions are 13"L x 9"W x 9"H.